Major League Lacrosse wants brand exposure and economic growth for the 2019 MLL season and beyond through the execution of strategic plans centered on expanding into calculated markets. The newest good news is the MLL reacquired their media rights back and voted in the ‘one team, one owner’ structure. The bad news is contraction of the league as part of a broader plan to restructure into Eastern and Western conferences also happened today. This resulted in devastating news for the dedicated lax communities that supported the Florida Launch, Ohio Machine and Charlotte Hounds, and no, this is not an April Fool’s joke. Six teams remain, the Atlanta Blaze, Boston Cannons, Chesapeake Bayhawks, Dallas Rattlers, Denver Outlaws, and New York Lizards. The Hounds are looking to return for the 2021 season under new ownership. The Sports Techie community blog spoke again with MLL Commissioner, Alexander “Sandy” Brown, about the evolving state of the league. The new Premier Lacrosse League (PLL) stepped up the professional field lacrosse business stakes and the MLL is responding accordingly. MLL was founded in 2001 thus their strategic plans are actually 19-years in the making. Sandy is the new Commish coming on board one year ago, the first change in MLL leadership in 14-years. As a result, the league went through a rebrand, added more initiatives, drafted in Charlotte, and got their media rights back from Lacrosse United Marketing all in less than 12-months’ time. Next up is a planned expansion into strategic markets. MLL is going to establish Eastern and Western Conferences. Traditionally, the league is heavily leveraged towards an East coast tilt. The long-time concentration of MLL business in the N.E. is migrating to where double digit growth in lacrosse is currently happening, explained Sandy, in the Sun Belt, Pacific Northwest, California and Minnesota. The Hounds are returning to play after American Legion Memorial Stadium is finished in 2021. Reacquiring all the linear, digital and social broadcast media rights in order to air MLL games allows them to solicit several broadcast options resulting in broader distribution benefiting fans, players and league sponsors alike. Sponsors are not affected by the developments. Alexander says sponsors support what the MLL are trying to do resulting in a broader canvas for activations. He spoke to several sponsors today and everything is in good standing because their partners understand the reasoning behind these newest strategic moves. Development of robust digital team and infrastructure. Continued investment and development in digital. Added players to game-day rosters. Extended schedule from May 31 through September. Developing a full calendar of tent-pole events such as the All-Star Game, Championship Game and Draft. Sandy told me the recent draft was the best one in the history of league, some 550 attendees enjoyed the live event hosted at the NASCAR Hall of Fame. Introducing a cutting-edge statistical platform. Sandy discussed how the software development is coming along nicely. 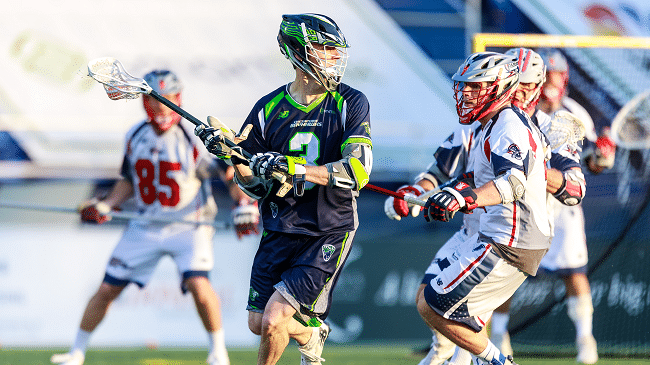 This sports tech offers multiple benefits to the MLL pertaining to data and the resulting push of metrics to players, broadcasters, fans and sponsors. Developing grassroots initiatives that will improve the league’s community programming. Sandy said the goal is to try and touch fans at a young age, in the 10-20 age group. They have an existing program in a number of communities in place for clinics and other innovative activations together with the players. Requiring digital, liner and social media rights is a big step towards sustainability as a business. Hiring Tom Johnson on the social media team was a game changer said Sandy. He previously worked at ESPN and Baseball American. “Social media has been off the charts since he was hired,” said the Commish. MLL digital and social following compared to the TLN, LSN, PLL and NLL is much larger, according to Sandy. Their loyal fan base is engaging with the new MLL created content resulting in a sticky environment sponsors like. Major League Lacrosse Continues Strategic Plan. Sports Techie, some of the business development by the MLL are truly innovative while other moves are long overdue like the one team, one owner rule. Sandy explained how this rule gives the MLL the opportunity to get a new ownership structure for voting while providing more opportunities for new ownership. With media rights back under one roof, this marks a critical, historical time in MLL history because linear, digital and social broadcast media are the biggest sources of league revenue. The PLL is together with Comcast which is NBC Sports. This leaves Disney/ESPN, Fox Sports, CBS Sports, and Turner Sports here in Atlanta, as possible broadcast partners with larger distribution. The new DAZN US, a live and on-demand Company, might also make sense. Best wishes to all those affiliated with the Ohio Machine, Florida Launch and Charlotte Hounds franchises. Lacrosse is booming across the country but like the economy, there are signs it is slowing down making MLL strategic plans the ones to beat.